4GwQPodcast Ep189 – #BattlefieldV, #Fallout76, Game Awards 2018, Xbox Black Friday Sale + More! An official “The Inner Circle” affiliate podcast. This week’s 4th Chair…will be empty! Sorry about that! We’ll fix that next episode! – BREAKING NEWS A PLENTY – Sony WON’T be at E3 2019 and Reggie Fils Aime from Nintendo says NO N64 Classic this year! – Astro is releasing a Scuf/Elite-like controller for PS4 and PC! Are we interested? – It’s going to be weird without any Red Dead Redemption 2 talk this week, but we have Battlefield V to fill the void now! It launches today for Digital Deluxe Edition owners and we played a TON on Xbox (essentially expiring our EA Access trials), so we have some impressions on the game. – Clownz and Assassin have had their chance to play the Fallout 76 full release, so we’ll get their thoughts on whether the game has improved enough from the disastrous beta! – The nominees for this year’s Game Awards are out, and the show is set to take place December 6th. How do we feel about the nominees/categories? – We’ll touch on the “surprise” Xbox Black Friday sale that sneakily went live yesterday on the Xbox digital store. Best/Worst deals? Please subscribe/like/bell/all the good things – but only if you liked the show! Oh, and donate if you’d like! We appreciate any and all financial support! 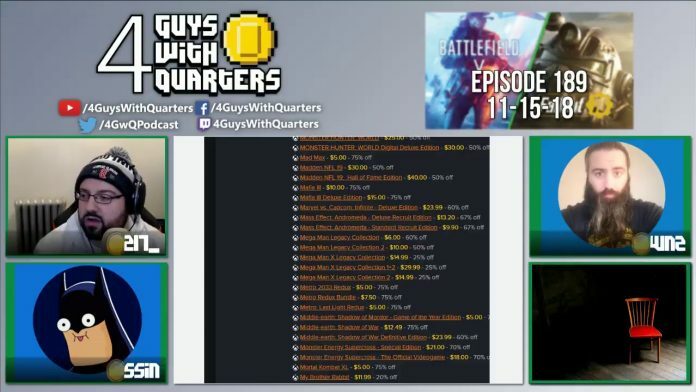 Thanks for your continued support of 4GuysWithQuarters. Please consider using these affiliate links below, which do not alter your normal shopping at your favorite online retailers. Your shopping through these links will provide us with referral bonuses, which will be used to improve our streams/shows and run more frequent giveaways. Next article4GwQ Ep 190 – FTC, Lootboxes, and More!